There's so much confusion about what to eat. Are you jumping from diet to diet and nothing seems to work? Are you sick of seeing contradictory health advice from experts? Just like the tobacco industry lied to us about the dangers of cigarettes, the same untruths, cover-ups, and deceptive practices are occurring in the food industry. 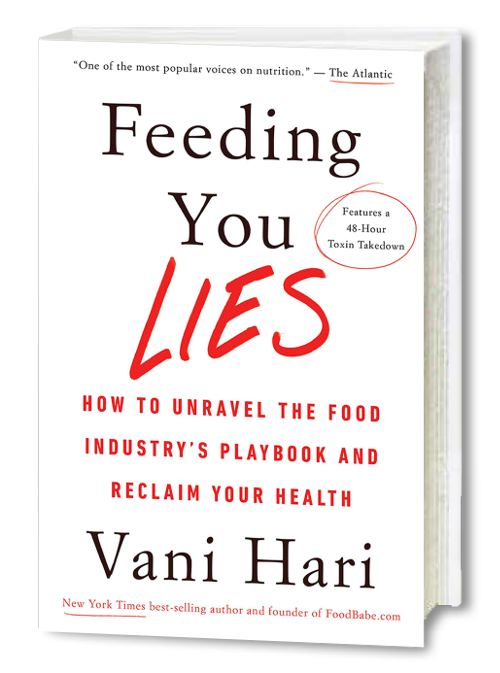 Vani Hari, aka The Food Babe, blows the lid off of the lies we've been fed about the food we eat - lies about its nutrient value, effects on our health, label information, and even the very science we base our food choices on. I was naive when I started blogging on Food Babe back in 2011. I thought everyone would be happy about what I wrote because I was helping people. I had no idea that my investigations into the food industry would produce such a firestorm. After we succeeded in changing dozens of food company ingredients and food practices for the better, we (the Food Babe Army) became a TARGET. Droves of critics were unleashed to take me down. They were organized by people with deep pockets, with a mission to protect the billion-dollar processed food and chemical industry. Now that I look back, I see how ignorant I was to think that nothing would happen to me. This group of critics weaseled their way into major newspapers all over the place, and said horrible things about me (that I was a crackpot and a bimbo, and worse). This was done to damage my credibility and to make me look like an uneducated crazy person. At first, I couldn't pin down exactly what was going on. I had my suspicions, of course, but I couldn't really prove that these people were getting money from the industry. And then slowly, but surely, the truth started to reveal itself. I submitted freedom of information act (FOIA) requests and received hundreds of internal emails. I met with someone who admitted he was paid by a firm to discredit my work. I went behind the scenes to really figure out more about what was going on. What I have now found is compelling evidence showing how these critics were connected to and were taking money from the food and chemical industries. I also uncovered how the industry will stop at nothing to keep their unhealthy products on the market, even if it means lying repeatedly to the public. And, this series of events led me to realize that…there are SO MANY LIES that the food industry has told us over the years. They manipulate us to buy their products and they use dirty tactics just like what the tobacco industry has done. I had an epiphany. I knew I had to tell people all about this. That’s when the book Feeding You Lies was born. This book is not something that has ever been written before. It’s told from my perspective and shares personal stories on how I figured out the lies that needed to be exposed. Certain individuals and companies do NOT want their lies to be published and that’s why I know this book is going to really open me up to attacks. And to be honest, this will not be easy for me. That’s why I really need your support. The best way you can support my new book is by ordering a copy. The book will be shipped to you on its release date on February 19, 2019, so you will get to be one of the very first people to read it. I’m not going to rely on traditional media to get this book out… I’m going to be relying on you. I’m relying on you to help get this book into the hands of more people. This will continue to educate the public about the lies of the food industry and let them know how they’ve been duped. We exposed their dirty ingredients in the first book, and we are exposing their dirty tactics in the second. Many food corporations have NO DESIRE to help us be healthy. They want to continue selling us their sugary, toxin-ridden products. There is nothing admirable about selling food that makes people sick. Just like we got major multi-billion dollar corporations to change in the past, we will do it again when their lies are finally revealed in this book. I thank you from the bottom of my heart for supporting the this book, asking your local bookstores to carry it, and for sharing this with your friends. You are courageously helping me stand up to the Big Food industry that always puts their profits over people. It needs to stop. Feeding You Lies isn't only a manifesto that recounts the sins of the food industry. I give you ACTION STEPS that protect you from cheap, processed, unhealthy foods and the health problems and suffering they cause. I provide you with the knowledge you need to make informed decisions. I help you overcome the obstacles standing in the way of you taking greater responsibility for your health. 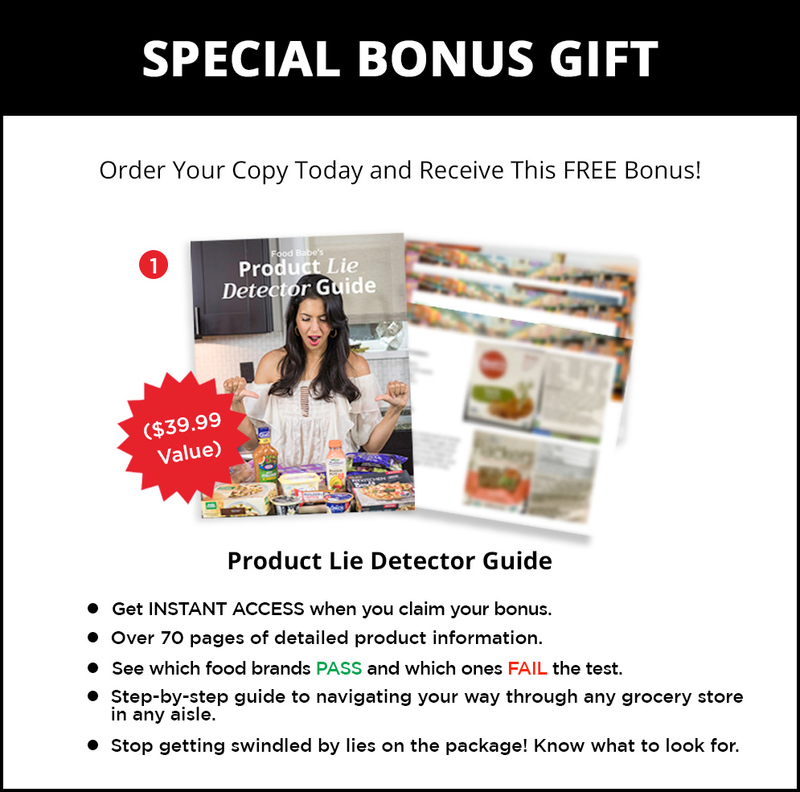 I help you dig deeper and look for evidence of deception in today's food world. I help you take control of your life - and change it for the better. "There are 3000 food additives in our food supply, many of which have not been tested for safety and the average American consumes three to five pounds of these chemicals a year. 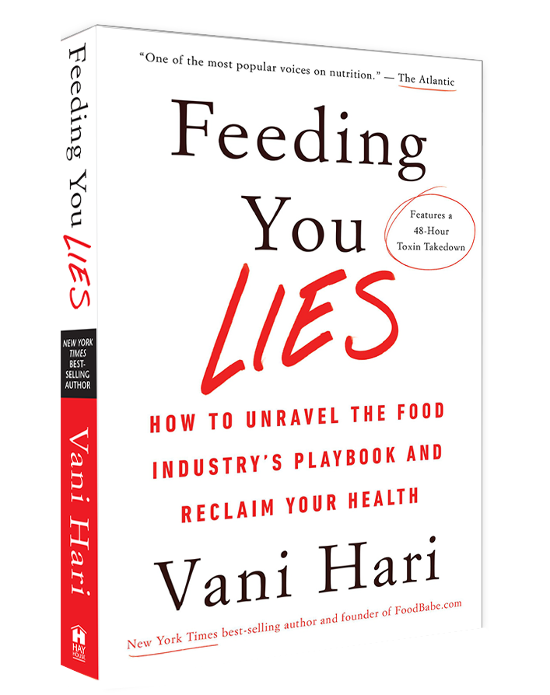 In Feeding You Lies, Vani Hari pulls back the veil of deception by the food industry, scientist and the media designed to manipulate us and ignore the unnecessary harms in our food supply. The deep investigation of the actions of the media, food companies and science to suppress the truth will shock you, make you stop and consider what you put in your mouth, as well as empower you with the tools and strategies to protect yourself from bad foods and lies. If you eat, read this book." "Anyone who wants to know what's really in their food needs to read this book by one of the most ambitious food activists I know, Vani Hari! We no longer have to be tricked by food labels thanks to her thorough expose." "With all the wrongdoings exposed in this book, it's no wonder that so many are confused about what to eat! You’ll never walk into a grocery store with the same outlook after learning the revealing information presented in this thoughtful read." "First you'll be shocked, then justly enraged. You'll see how greed can poison populations, you'll notice it everywhere you look, shop, and eat. And then!...you will make conscious and informed choices for your vitality. Read Feeding You Lies and you will become part of a global food and wellness solution that our bodies, souls, and planet require." "The tobacco industry survived for decades by marketing "doubt as our product". Big Food is following in their footsteps. I am grateful to Vani Hari for exposing the abuse of trust and the descending health of the public at the hands of Big Food. 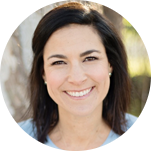 Her simple Three Question Detox is a platform to upgrade the health of your family. Everyone should read this book." "Our food is making many of us fat, sick and miserable; but it’s making certain companies billions of dollars. To us, the fact that disease rates are skyrocketing is a matter of life or death; but to them, it's just a PR problem. This magnificent book by the courageous and brilliant food activist Vani Hari shows you how to see through the lies, how to know the truth about what you are eating, and how to feed yourself and your family foods that will truly nourish your body, your mind, and your spirit." "A tangled web of deception is unraveled in this provocative page-turner! My eyes are now wide open thanks to Vani's tireless investigative work to expose the truth about the food we eat." Named as one of the Most Influential People on the Internet by Time Magazine, Vani Hari is a food activist, New York Times best selling author of The Food Babe Way and co-founder of Truvani. For most of her life, Vani ate whatever she wanted - candy, soda, fast food, processed food - until her typical American diet landed her where that diet typically does, in a hospital. Despite her successful career in corporate consulting, Hari decided that health had to become a priority. Her newfound goal drove her to investigate what is really in our food, how it is grown and what chemicals are used in its production. The more she learned, the more she changed and the better she felt. Encouraged by her friends and family, Hari started a blog called foodbabe.com in 2011. It quickly became a massive vehicle for change. Foodbabe.com has led campaigns against food giants like Kraft, Starbucks, Chick-fil-A, Subway and General Mills that attracted more than 500,000 signatures and led to the removal of several controversial ingredients used by these companies. Through corporate activism, petitions, and social media campaigns, Hari and her Food Babe Army have become one of the most powerful populist forces in the health and food industries. Her drive to change the food system inspired the creation of her new company called Truvani, where she produces real food without added chemicals, products without toxins, and labels without lies. Hari has been profiled in the New York Times and USA Today, and has appeared on Good Morning America, CNN, The Dr. Oz Show, The Doctors and NPR. Vani lives in Charlotte, North Carolina with her husband Finley and daughter Harley.